Artisan are Hilary Spencer, Jacey Bedford and Brian Bedford. They are three friends who decided to sing together for fun way back in 1984 in deepest darkest Yorkshire. "It was pure luck," says Jacey, "Our voices blended so well, right from the start, that we had lots of encouragement from friends and that prompted us to work really hard. Within a couple of years we were being invited to festivals and events all over Britain. By 1988 we were getting so much work that we either had to give up singing or give up the day-jobs. Finally in 1989 we became full-time vocal harmonists. " Since they hit the road they've taken their own brand of harmony and humour round Britain, Europe, Canada, the USA, Australia and Hong Kong. They've played venues both large and small, from folk clubs in upstairs pub rooms to open-air festivals with audiences of thousands. Artisan's special talent is making friends with an audience. Some of the interesting and unusual venues Artisan have played include the gun-deck of the HMS Victory (Nelson's flagship) in Portsmouth Naval Dockyard; the 14th century Chapter House of Lincoln Cathedral; the Royal Shakespeare Company's Swan Theatre at Stratford on Avon; Rochester Cathedral; The World-Famous City Varieties Music Hall in Leeds and the Georgian Theatre Royal in Richmond. North American venues include Longwood Gardens, Pennsylvania; The Chocolate Church, Bath, Maine; The Birchmere, Washington CD; The Ice House, Bethlehem, Pennsylvania and Coupeville Performing Arts Centre, Whidbey Island, Washington State. Their recent appearance at America's foremost performing arts centre in Washington DC - The Kennedy Center was webcast live and is now archived at the Kennedy Center website, Millennium Stage page (search for Artisan on 11th December 2004.) They have also played hundreds of folk clubs, arts centres, coffeehouses, concert series, theatres and halls all over Britain, Canada, the USA, Germany and Belgium. Some of the festivals they've played include the Edinburgh Festival Fringe, the award-winning Vocal Chords A Cappella Festival at The Barbican Centre, London, Sidmouth International Folk Festival, Vancouver Folk Festival (BC, Canada), Winnipeg Folk Festival (MB, Canada), Mariposa Folk Festival (ON, Canada), Lunenburg Folk Harbour Festival (NS, Canada), Bethlehem Musikfest (PA, USA), Philadelphia Folk Festival (USA), Central Pennsylvania Festival of the Arts (PA, USA); Lancaster Festival (Ohio, USA); Minnesota State Fair, (MN, USA); Gooik Festival (Belgium), Nordic Folk Festival and Festival Am Ith (Germany), Old Songs (USA). The New Jersey Folk Project (USA); Spring Gulch Festival, Pennsylvania (USA); Chippenham Folk Festival, (UK); Brampton Live Festival, Cumbria (UK) Earth Air Fire & Water--Goderich Celtic Festival, Ontario, (Canada); and Owen Sound Summerfolk Festival, Ontario, (Canada). Then in Australia there was Port Fairy Festival and Nannup Folk in the Forest, and back at home Tamworth, Holmfirth and Otley, Moore & Coast, Cleethorpes, Sidmouth, Broadstairs, Bromyard, Saltburn, Cleckheaton, Maryport, Birdsedge, White Horse, Upton on Severn, Cromer's Folk on the Pier, Four Fools (Chorley), Broadstairs, Bridgnorth, Trimdon & Trowbridge. Plus lots more too numerous to mention, but which were enjoyed just as much. 2005 was Artisan's final year - but it is also their celebration of twenty years in the business. In spring they did a 43 date Twentieth Anniversary Tour, followed by festivals such as Glenfarg Folk Feast, Chippenham, Cleckheaton, Warwick, Brampton and Bromyard. They made one final transatlantic trip in August to play Lunenburg Folk Harbour Festival, Bethlehem Musikfest, Owen Sound Summerfolk and the Philadelphia Folk Festival. Their final weekend of concerts was in November with Saturday 19th November at the Georgian Theatre Royal in Richmond and Sunday 20th November at Penistone Paramount Cinema (2 houses matinee and evening). See Endnotes for more details. A superb DVD of the final concert is available direct from Artisan. See the albums page or call Artisan on UK 01484 606230. Not quite fionished with singing yet, Artisan did a hugely successful reunion tour in 2010 and will be doing a second, limited date, reunion tour in 2015. You just can't keep a good group down. 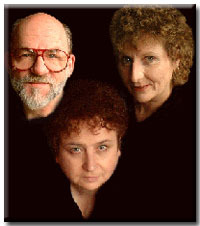 Artisan have recorded elevenalbums together and have appeared on numerous compilations. Their whole album history and mail order is on the Albums page of this site. 1999 Nomination Best Holiday/Christmas Album "Paper Angels"
2000 WIN Best World/Roots Album "Dancing With Words"
Artisan's songs were frequently heard on radio. In England you were as likely to hear them on BBC Radio 4 as Radio 2. They appeared on Ned Sherrin's Loose Ends, Kaleidoscope, Comparing Notes, The Arts Programme, Folk on 2 and Not Today, a Christmas Day special. They also did their own "Artisan in Concert" show for BBC Radio2 and "Stuff the Turkey", a networked Christmas show. Jacey has also presented her own short series for the BBC called "Thinking Our Loud". They appeared with Ian McMillan on a BBC Radio 4 special 'Home for Christmas' for which Brian co-wrote the title song with Ian. Radio broadcasts abroad included BRT in Belgium, WDR in Germany, CBC in Canada and airplay across the Canada and the USA on a variety of public and commercial stations. On their tour of Australia they played no less than five ABC radio stations all across the continent and they have become regulars on Radio WDIY in Pennsylvania. They appeared on TV too, in England, Germany and Canada .